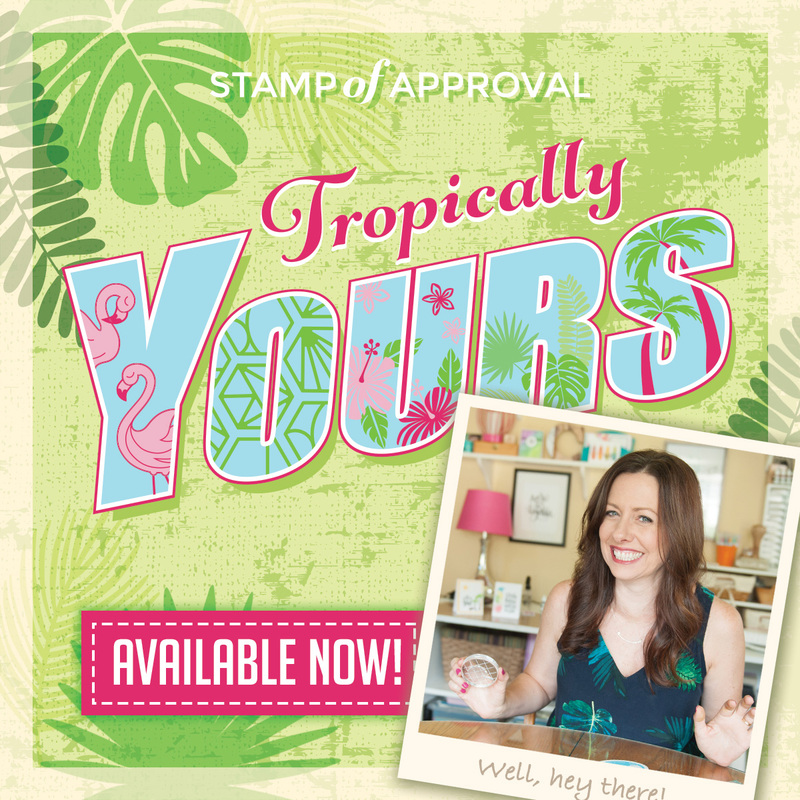 Thanks for joining me today as I showcase these ridiculously fun products from the newest Stamp of Approval Tropically Yours collection! You can find the new collection here. Confession: I have never really been crazy about flamingoes. I think my problem is that I start following a trend approximately 5 years after it's reached its peak of obsession. What can I say? I was always a late bloomer, so that's my excuse. Anyway, flamingoes seem to be very on trend these days, but I've never really gotten hooked on them. These flamingoes are just so stinking cute! 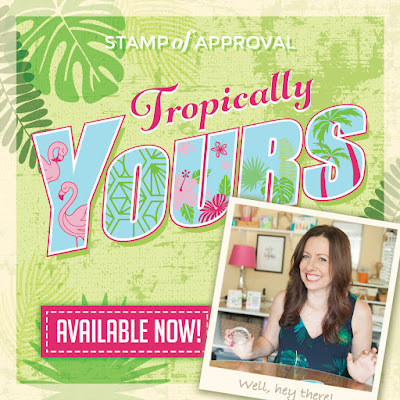 I had so much fun coloring the images after I stamped them out. I colored them with my copics and then used the coordinating dies to cut them out. I also stamped the water and grass images from the same set, die cut them out, and then set them aside as well. I trimmed down a card panel to be 4 x 5.25 inches, and then adhered all my images to that panel. I also added the sentiment and then set off to create the card base. I cut and scored a card base to be 4.25 x 5.5 inches, and then I used the border image from the stamp set to create the border on the left edge. I then trimmed down my card panel with my flamingo images a bit more...I think I ended up trimming off about .25 inches from the right side of the panel. When you're creating a card and you feel like it's falling a bit flat or looking a little boring, you can pull out the same secret weapon that I do--coordinating borders/edges. I used one of the copic markers I used to color my flamingoes to color the right edge of my card base. This gives a finished edge and brings the whole card together! I mounted my card panel with fun foam and then glued it on to my card base to finish everything off. Thanks so much for stopping by today and happy crafting! You don't want to miss this fantastic collection because the awesomeness *literally* cannot be contained sometimes. (That means that the collection sells out quickly!). Your wallet might scream but GO ON!! You can do it!